The usd to cad currency pair continue their inexorable consolidation move, with the pennant pattern on both the weekly and the daily chart becoming ever stronger. 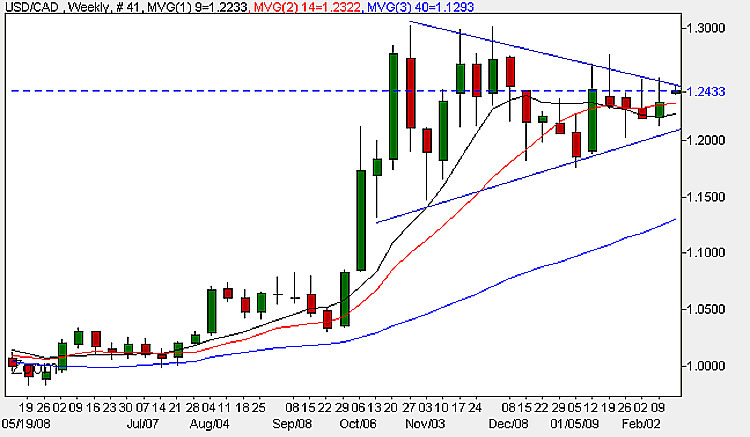 Last week saw yet another doji candle, with the upper wick touching the upper trend line, as for the week before. Until we see a breakout from this pattern then the pair are impossible to trade at the moment. This weeks fundamental news for the Canadian Dollar is centered around Friday with the release of Core CPI figures, which come an hour earlier than the equivalent in the US. This number is the change in the price of goods and services purchased by consumers, excluding food and energy. The reason it is so important is that food and energy prices account for about a quarter of CPI, but they tend to be very volatile and distort the underlying trend, and as a result the FOMC pays the most attention to the Core data, as do traders! The forecast this time is -0.1% against a previous of -0.4%, and if the numbers are better than expected then this is generally good for the home currency, in this case the Canadian dollar. The fundamental news for the US dollar is covered on the euro to dollar site.